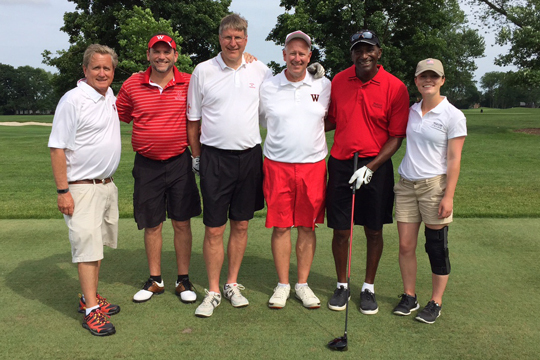 Trustee Jim Davlin ’85 recently hosted some of Wabash’s senior leaders for a day at his local golf club. In this case, it was the Oakland Hills Country Club in Michigan. Joining Jim (third for the right) were Dean of Students Mike Raters ’85 (second from left) and CFO Larry Griffith (to Mike’s left.) Also playing that day was our newest Dean, Alan Hill. (That’s Alan with the driver.) Alan becomes our first dean for Professional Development on July 1. As you can tell for the smiles, it was a fun day for all.